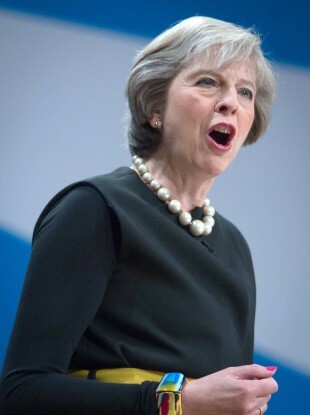 British prime minister Theresa May addresses the Conservative Party conference. THE BRITISH GOVERNMENT will force companies to list all their foreign workers in a bid to shame firms that turn down UK citizens. The proposals, revealed by the new UK Home Secretary Amber Rudd at the Conservative Party conference yesterday, are intended to pressure companies to take on more local workers and to “prevent migrants taking jobs [that] British people can do”. It is believed that, as the proposals refer to non-British workers only, that the list will include EU citizens, including those from the Republic of Ireland. The UK Home Office was unable to confirm this following a query from TheJournal.ie this morning, but said further clarification will be forthcoming later today. Rudd, who lived in New York for several years, also promised to target students from outside the EU with tougher visa rules, in a speech to applause from Conservative Party members. She has denied the proposal is xenophobic. The London Times reports that it would initially apply to non-EU workers, but be extended to all non-UK staff upon the completion of Brexit. Business would be expected to publish the figures for each site where the workers were based. “The test should ensure people coming here are filling gaps in the labour market, not taking jobs British people could do,” Rudd said yesterday. After keeping a decidedly low profile since his re-election as Labour leader, Jeremy Corbyn finally released a statement this lunchtime condemning the Government’s plans. Conservative Party leaders have sunk to a new low this week as they fan the flames of xenophobia and hatred in our communities and try to blame foreigners for their own failures. “We should be able to have a conversation about immigration, we should be able to have a conversation about what skills we want to have in the UK and whether we need to go out of the UK in order to get them to boost our economy and I don’t think we should have a situation where we can’t talk about it,” she told BBC Radio 4’s Today programme. The scheme was one of several under consideration and “not something we’re definitely going to do”, Rudd admitted this morning. Her comments have sparked a backlash among business leaders, who point out that migrants benefit the economy, amid record levels of employment in the UK. Liberal Democrat home affairs spokesman Alistair Carmichael said the plans could have come from the hard right of the Tories, who are attempting to heal it divisions over the Brexit referendum. Lord Bilimoria, the chancellor of Birmingham University told BBC Radio 4 that Rudd’s plans were “absolutely shocking”. Rudd also said that the Government would look at “tougher rules for students on low quality courses”. From December meanwhile, landlords who knowingly rent to illegal immigrants could go to prison. Taxi drivers will also face a clampdown, while bank accounts also face checks. Jess Phillips MP, a close friend of Jo Cox, the MP who was shot dead in her constituency, is one of several MPs who have criticised the proposals. Her husband blamed her killing on the divisive and ‘coarsening’ tone of the Brexit debate. A man accused of her murder refused to enter pleas when he appeared at the Old Bailey in London yesterday. Referring to Rudd’s speech, Phillips said “division killed my friend”, in reference to the late Labour MP. Defence Minister Liam Fox also told the conference that EU citizens living in the UK consisted of the Government’s “main card” in Brexit negotiations. A Scottish National Party MP, has compared the plan for a list of foreign workers to the policies pursued by the Nazi Party in Germany during the 1930s. The Green Party has said the “falsehood” that migrants are to blame for the UK’s problems “must be confronted head-on”. The new proposals follow the announcement that England will train more doctors so that it can end its reliance on foreign recruits for the state-funded National Health Service after it leaves the European Union. “Currently a quarter of our doctors come from overseas,” Health Secretary Jeremy Hunt told the ruling Conservative Party’s conference in Birmingham. “They do a fantastic job and the NHS would fall over without them. When it comes to those that are EU nationals, we’ve been clear we want them to be able to stay post-Brexit,” he said. But looking forward, is it right to carry on importing doctors from poorer countries that need them, whilst we turn away bright home graduates desperate to study medicine? From September 2018, England will train up to 1,500 more doctors every year, increasing the number of medical school places by up to a quarter, he said. There is currently a cap of 6,000 on the number of medical students. “By the end of the next parliament we will make the NHS self-sufficient in doctors,” Hunt added. Hunt said training a doctor costs more than £200,000 (€230,000). Doctors would be asked to work for the NHS for four years in return. Rudd also told the conference that the Government is committed to getting annual net migration below 100,000. It stood at 327,000 in the year ending March 2016, of which 190,000 were from outside the EU. Her consultation includes looking at whether student immigration rules should be tailored to the quality of the course and the university. It will also consider whether to tighten the rules on recruitment and job advertising to make sure immigrants are not coming to jobs that could be done by British workers. Brexit minister David Davis meanwhile said a work permit system might apply for “low-skilled” migrants. Email “The UK Government wants to draw up a list of all 'non-British' workers”. Feedback on “The UK Government wants to draw up a list of all 'non-British' workers”.